Blueberry Fluff is outstanding. Take a deep breath. Exhale. Open your eyes. Get a load of this yummy “salad,” ahem, dessert. Blueberry Fluff. Yep. Blueberry pie filling, crushed pineapple, pecans, Cool Whip and condensed milk. This amazing 5-ingredient fruit salad recipe is to die for! I mean it. It’s the simplest of all possible recipes yet it is so good. 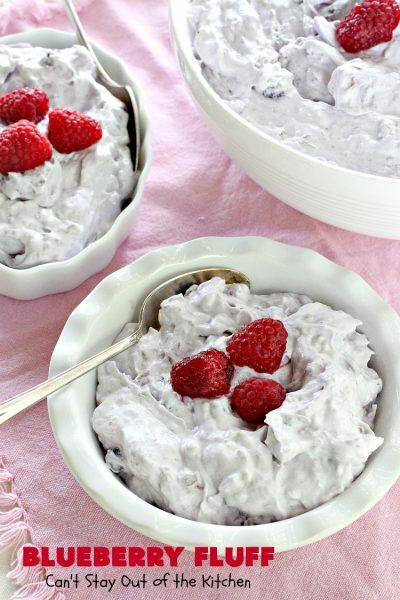 We love fluffy salads and desserts anyway and I have a bunch of them already posted, like Pink Fluff, Cherry Fruit Salad, Ambrosia Waldorf Salad, Six Cup Salad, Pistachio Fruit Fluff Salad and Taffy Apple Salad. Each is wonderful in its own special way and I make them all often. My husband is a pineapple lover, however. Since Blueberry Fluff has pineapple in the ingredients, it is a cinch that he’s going to love it. Yes, indeed. This “salad” is ooey, gooey and delicious with a little fruit thrown in to keep you happy. 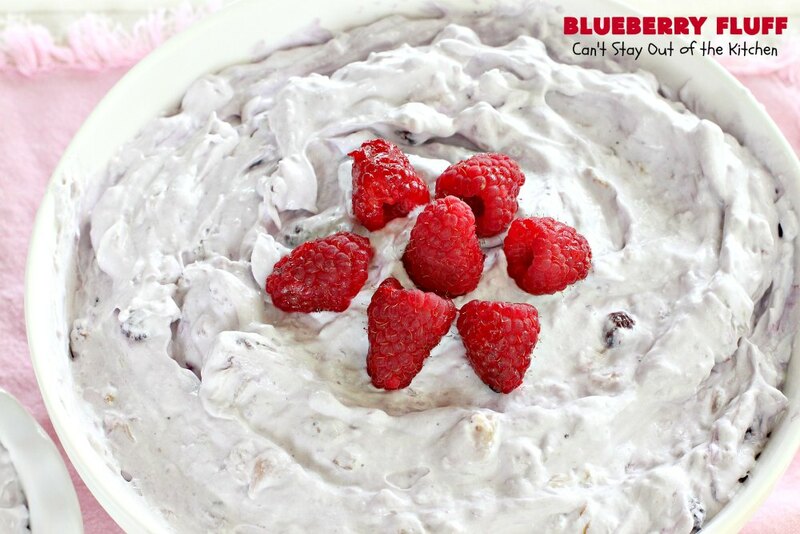 While Blueberry Fluff is gluten free, it can in no way be considered healthy since it uses a can of sweetened condensed milk, which means it has a good bit of sugar! It can, however, be called spectacular in taste and texture. I made this fruit salad for company back in late August. For only 5 ingredients it makes a pretty large batch, probably enough to feed about 20 people if you’re serving other food. It’s ideal for a potluck salad/dessert, Thanksgiving or Christmas dinner (or any holiday dinner for that matter), office parties or anytime you’re getting together with friends and serving food. 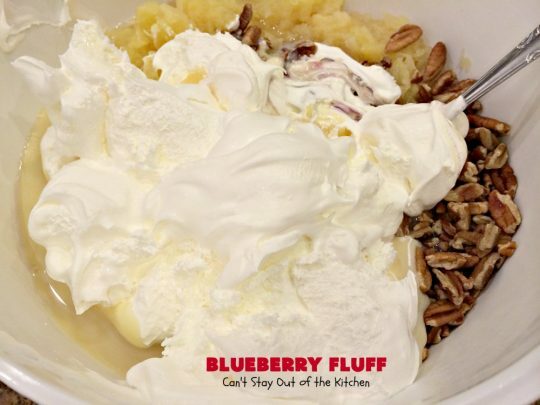 I guarantee you, most people won’t be able to keep their hands off the serving spoon once they taste a bite of Blueberry Fluff. 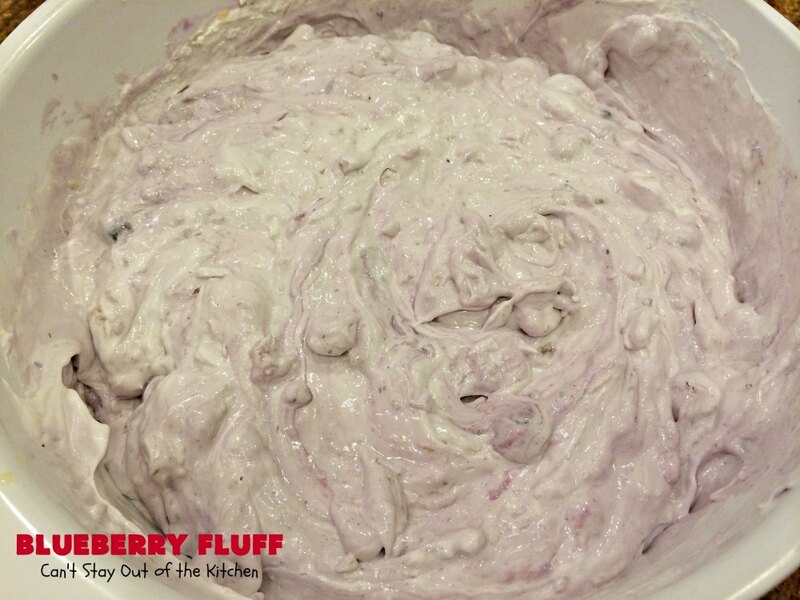 Blueberry Fluff is inspired by my Pink Fluff recipe that Christy Coleman brought over for lunch at our house one time earlier this year. The only difference is that I used blueberry pie filling instead of cherry pie filling this time. That’s it. 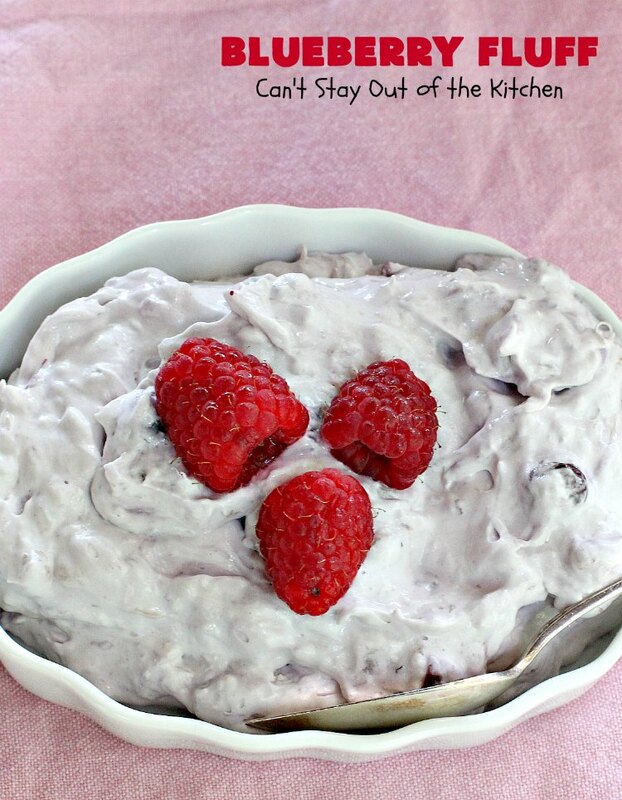 This simple recipe is conducive to any kind of fruit pie filling: blackberry, raspberry, strawberry, pineapple, and if you prefer something on the wild side, I bet it would be good with lemon or key lime pie fillings as well! If you’re looking for comfort food extraordinaire, then look no farther than Blueberry Fluff. Your family will rave over this recipe. 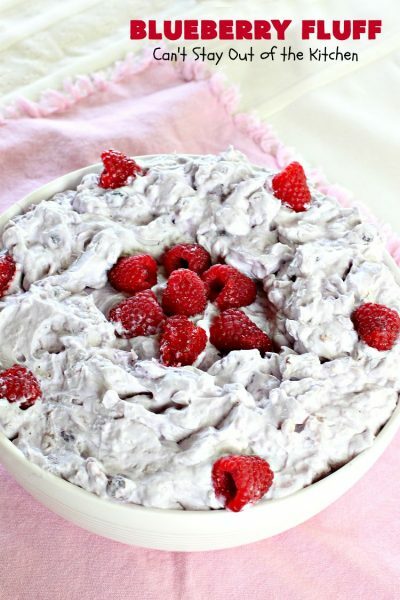 I bet you will be asked to make it for holiday functions frequently because it’s so delectable. If you’re looking for a perfect recipe that comes out great every time and that’s so easy that even your kids can mix it together, give Blueberry Fluff a try. You will be addicted after one bite. Sigh. Exhale. Close your eyes. Take one more bite. Yum. 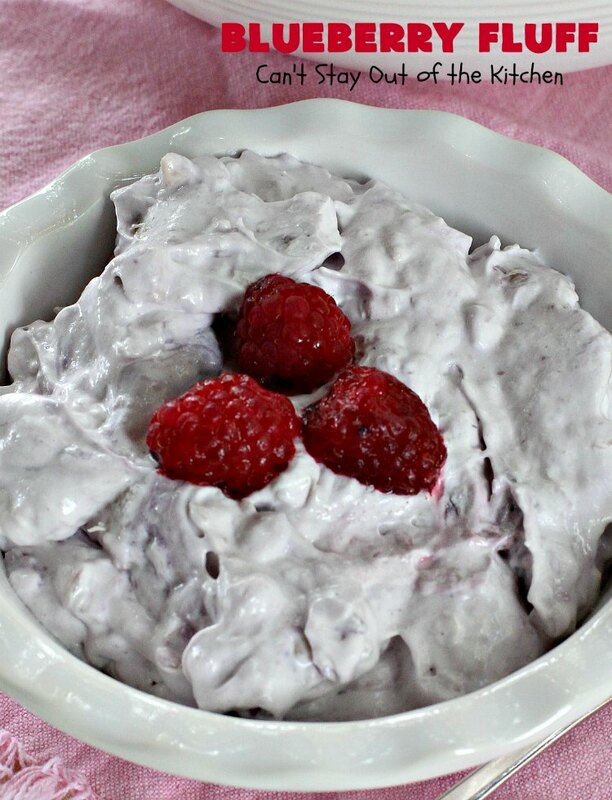 Blueberry Fluff is a magnificent side salad or dessert. You can serve it either way. 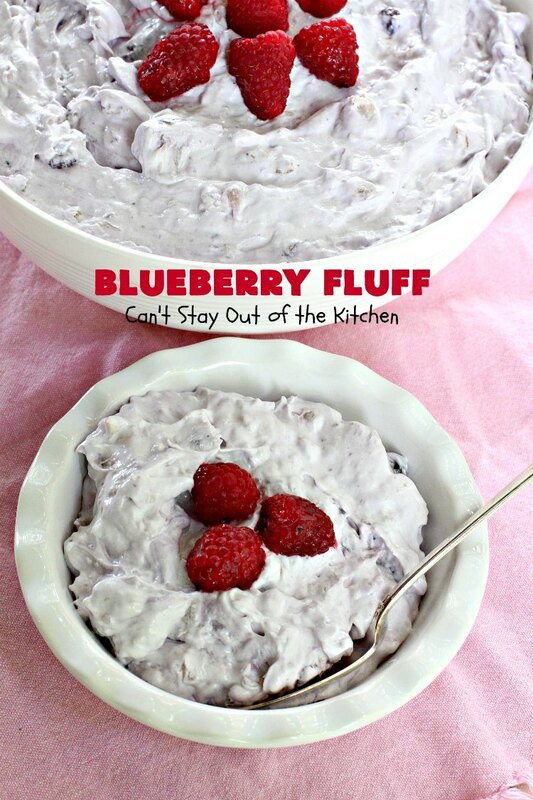 Blueberry Fluff has only 5 ingredients. It’s super easy to make. 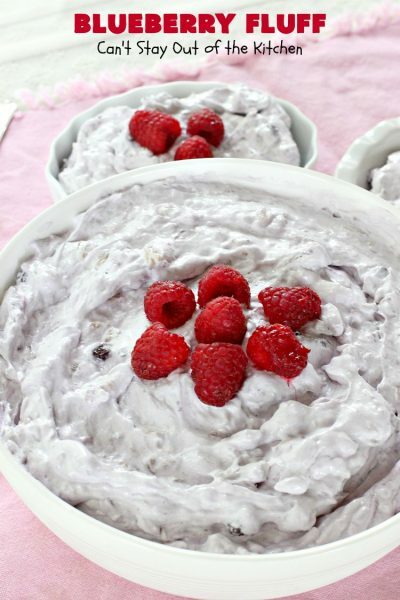 This delightful salad or dessert is great for holiday entertaining. Put it on your holiday menu this year. 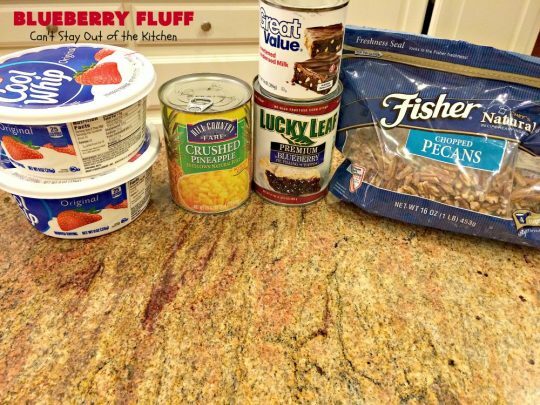 I used these ingredients to make Blueberry Fluff. 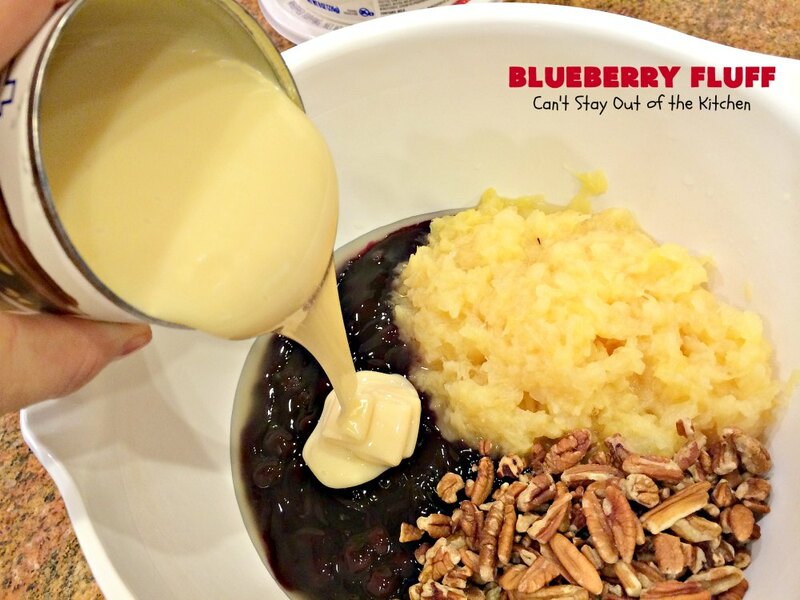 Pour blueberry pie filling into a mixing bowl. Add partially drained crushed pineapple, pecans and condensed milk. Decorate Blueberry Fluff as desired. You will be drooling over every mouthful of Blueberry Fluff! This cool, refreshing salad is perfect for summer holiday fun. Every bite of Blueberry Fluff will have you drooling. This amazing 5-ingredient fruit salad recipe starts with Lucky Leaf pie filling, crushed pineapple, condensed milk, pecans and Cool Whip. It's so easy to make and a great side for holiday meals. Stir all ingredients to combine. 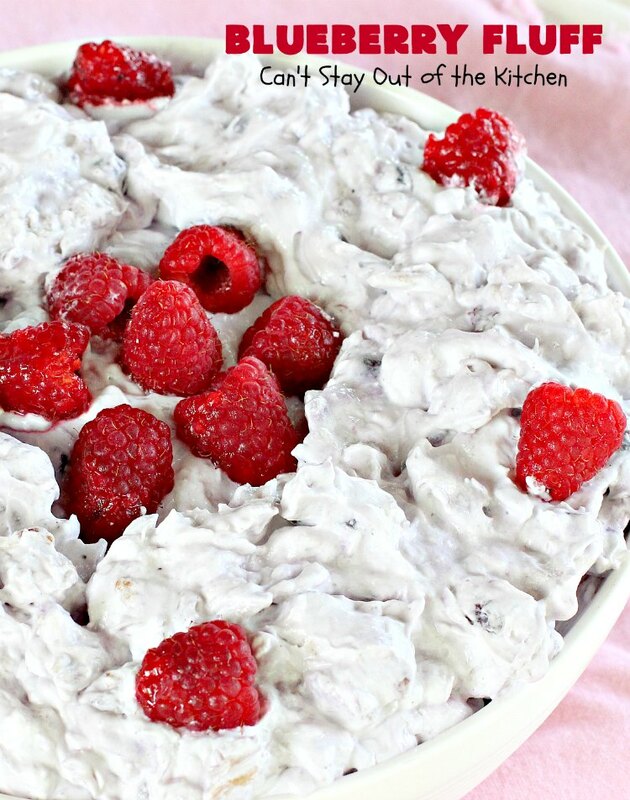 NOTE: This recipe has limitless combinations: Peach Fluff, Pineapple Fluff, Blackberry Fluff, Strawberry Fluff, Raspberry Fluff, Lemon Fluff, Apple Fluff, etc. This amazing 5-ingredient fruit salad recipe starts with [url href=”http://www.luckyleaf.com/” target=”_blank” title=”lucky leaf”]Lucky Leaf[/url] pie filling, crushed pineapple, condensed milk, pecans and [url href=”http://www.kraftbrands.com/coolwhip” target=”_blank” title=”cool whip”]Cool Whip[/url]. It’s so easy to make and a great side for holiday meals. This recipe has limitless combinations: Peach Fluff, Pineapple Fluff, Blackberry Fluff, Strawberry Fluff, Raspberry Fluff, Lemon Fluff, Apple Fluff, etc. 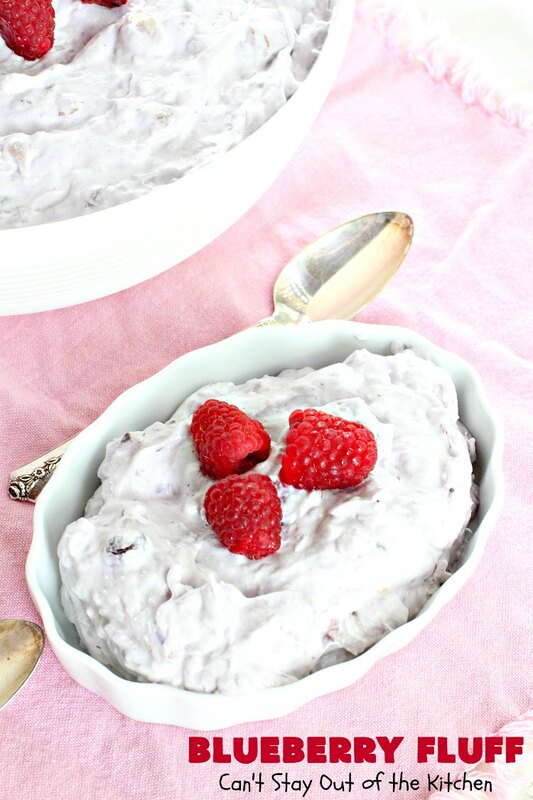 You won’t have any leftovers if you serve Blueberry Fluff for your next company meal. Doesn’t Blueberry Fluff look fantastic? If you enjoy light, fluffy desserts, this delicious salad should be on your menu!